Another week, another Halloween manicure! I was hoping that I would have some creepy cool Halloween nail stamp in my collection, but I couldn’t find anything (note to self: buy more festive nail stamp plates). So I racked my brain and searched through my polishes to find this neon orange nail polish and an old set of skull nail strips. I really don’t understand why I stopped using these Sally Hansen nail strips because they are seriously the best! If I didn’t already paint my other nails orange before applying the one skull strip I probably would’ve put them on all of my nails! I mean it’s not Halloween without some good skull and crossbones nail art…am I right or am I right?? 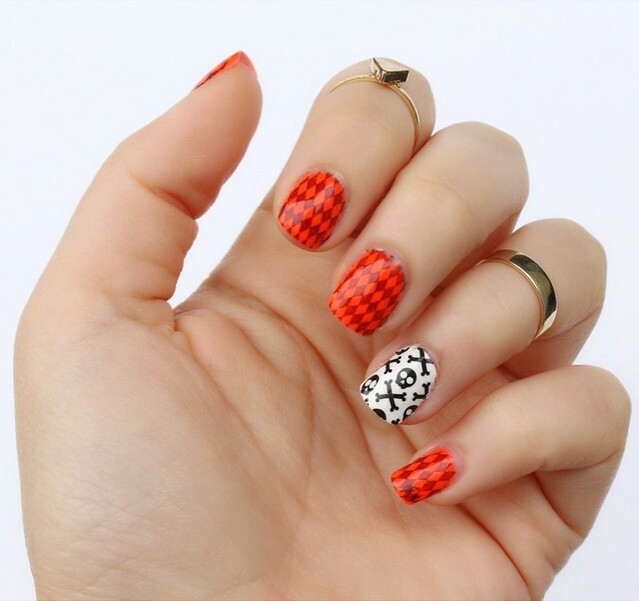 Looking for more Halloween Manicure Ideas? Here are my favorites from over the years! Super cute!! I think I have those same nail strips!